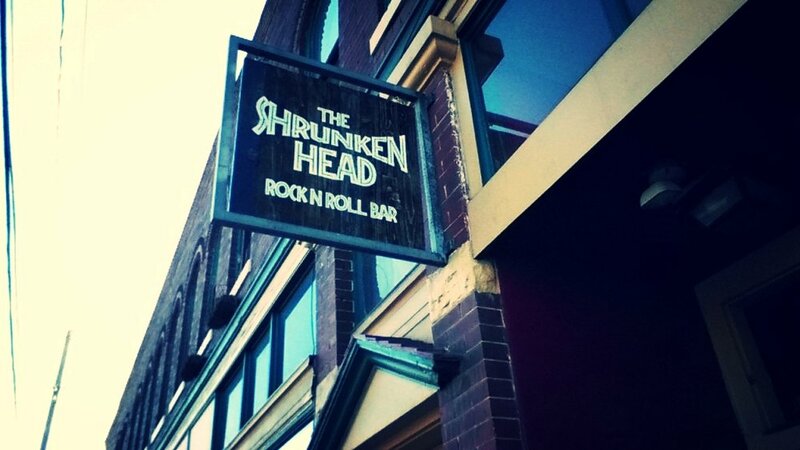 The Shrunken Head Rock n Roll bar is a smaller venue on the north side of the city that offers a full bar, kitchen, live music, and even recording services. It would be wrong to call it a dive bar, but it definitely presents itself with that sort of atmosphere. The low-level glow of antique lamps along with brick and red plastered walls give it an appropriately fitting gothic vibe. The stage is positioned in the front corner of the bar with an acoustically treated brick wall and showcase window as the backdrop. Its cornered position allows for easy viewing from any spot in the bar and helps balance the acoustics in the bar's less than ideal acoustic environment. Its a comfortably sized stage for the average band, but it may be a tight fit for larger groups or those who have an atypical musical arrangement. One advantage is that the adjacent corner is used for equipment storage allowing for a quick set up between sets. The acoustics of the venue are surprisingly good considering the circumstances. The various materials such as brick, plaster walls, and hardwood floors create a warm reverb and prevent pesky frequency build-ups. The experienced audio engineer Nick Magoteaux does a fantastic job at balancing levels and creating an appropriate live mix for each performance. I've noticed him adjusting the mix throughout performances while listening in from multiple positions in the room to make sure that each detail of the performance shines. As with any small venue where your head is only meters from the speakers it can get pretty damn loud, but the integrity of the music is never compromised by it. The artists this bar pulls in mostly dwell in the rock-oriented neck of the woods with sounds ranging from laid back southern roots to distortion laden grunge. The crowd always seems to be post-college grad aged individuals donning plaid flannels over their favorite band t-shirts. Some get down on the dance floor, most hang back while drinking PBR. One unique feature of The Shrunken Head is the recording services they offer. They currently have the ability to record live performances and have also recently started offering studio recordings using the venue during its downtime hours. If you're looking for a unique sound to imprint on your next EP or album, the acoustic environment of this venue may have something to offer. Even groovier, according to their website they're building an echo chamber in the basement which will provide the ability to add some gnarly sounding tracks to your latest works without having to resort to overly digital sounding plugins. All music business aside. The full-service bar offers all the liquor choices that you'd expect. The draft beer selection is nothing bedazzling, and you won't find anything you haven't had thrice before. A draft beer selection does exist though. If you're like most people and want your alcohol for dimes on the dollar, then its probably worth mentioning their pretty killer happy hour. Everyday (yes, including Saturday) from 3PM-7PM they'll give you any drink behind the bar for half the booty. From 5PM-6PM they'll throw well drinks and PBR/Yeungling drafts your way for a buck. If your thirst is greater than your tolerance, their new kitchen is open from 5PM-12AM to serve you up some grub to help soak up the excess of booze sloshing in your belly. Lastly, I should mention that they have a pool table, pinball machine, and a patio for all of your fresh air and cigarette smoking needs. Overall this is an excellent little venue that offers good times and good music. If you're looking for some weeknight action, you might want to stop in for their acoustic open mic nights on Wednesdays or open mic comedy nights on Monday. Shows are hosted on Fridays and Saturdays at 9PM. There are also happy hour performances at 6PM on Fridays. Parking: Only street parking is available. Be conscious of where you park though as there are some permit only spots in the area that could land you a ticket. Include in your email a digital press kit (or a link to it), your estimated draw of audience, a link to your website, and at least one video of a recent live performance.